By General der Infanterie a.D. Friedrich August Schack, March 1948. The LXXXI Corps on the right and the LXXIV Corps on the left, subordinated to Seventh Army, had as mission the concentration of the remaining elements of their former units and, through a withdrawal movement northeastward, of establishing a loosely-connected defensive front along the line Louvain - Charleroi. Whether this could be done would depend upon the time and place at which the concentration was successfully achieved. Fifteenth Army, withdrawing farther north, was to attack in an easterly direction, from the area north of Lille, (France), in order to establish contact with Seventh Army. The right sector boundary for the LXXXI Corps, and Fifteenth Army boundary was established as Louvain - Hasselt - Maastricht - Duesseldorf. The LXXXI Corps had at its disposal a few Kampfgruppen composed of the remains of several divisions, and the 353d Division, which had been pushed northward via Valenciennes - Brussels and was now concentrating south of Eindhoven (Holland). Louvain itself was protected by a newly-organized Kampfgruppe Viebig -- one security battalion, one assault gun battalion, and men who had been separated from their units. Farther south the reconnaissance battalion of the 116th Panzer Division protected the Rapel and the Dyle Rivers as far as Wavre. The 116th Panzer Division was in the vicinity of Gembloux and Fleury, in front of the LXXIV Corps sector, and the 347th Division, held a thin security line, north of Namur. Enemy Troops. 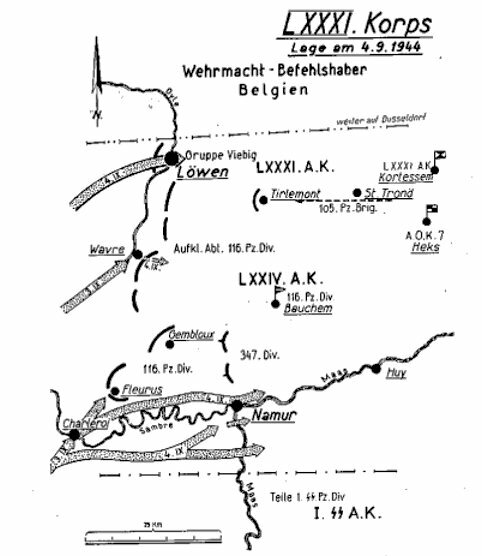 A British army group was advancing toward Antwerp, probably with the mission of capturing the V-1 bases and completing the encirclement of Fifteenth Army. It was followed by an American task force of about six to eight divisions. The bulk of the U.S. Third Army was assumed to be in the Verdun area and was expected to attack the line Luxembourg - Metz. In addition, a large airborne landing was expected at the West Wall area. Increasing numbers of French and Belgian resistance groups were taking part in the operations. On arriving at LXXXI Corps Headquarters, in Cortessem, 11 kilometers west of Tongres, on the afternoon of 4 September I found a complete staff ready - typical during that period. Thanks to their motorization and consequent mobility, the staff and all the headquarters units had remained intact, but the troops, through lack of mobility, had again and again been outdistanced, encircled, and routed by the enemy. Nevertheless the command cadres, together with large and small groups of cadre personnel from other units, enabled us to assemble the men who had become separated from their outfits and to organize them into new units. The Corps headquarters had lost contact with the 275th, 344th and 49th Infantry Divisions, formerly subordinated to LXXXI Corps. 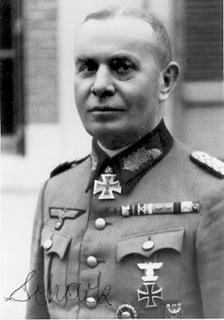 However by radio and motorcycle messengers was established with Kampfgruppe Viebig at Louvain. It had been learned that enemy armor had reached Brussels during the evening of 3 September and that in the LXXIV Corps Sector, on our left, Binche had been captured after heavy fighting. Toward evening strong enemy forces entered Louvain from the southeast. The 105th Panzer Brigade was therefore assigned to LXXXI Corps and ordered to move into an assembly area in the vicinity of Tirlemont, for a possible counter-attack. Otherwise the day, in general, passed quietly.